Reagan slept like a log last night. I heard her in her bed this morning making noises, just happy as can be. She really has been in a great mood today...I guess that's what a good night's sleep can do for you! All day she's been sweet and smiley and several random times today she broke out into laughter (which is rare occurrence for her). It was beyond adorable. She had feeding therapy today at noon and then Feldenkrais/ABM right afterward. She was extremely spitty, so it wasn't exactly the best conditions for feeding therapy. There was a constant drip coming out at all times. The banana she tried came right back out on a wave of spit. Oh well, you can't win them all. Then we went over for her Feldenkrais/ABM session. Her practitioner was out of town last week but we're back into full swing this week and planning on doing another 5-day block of sessions. I'm hoping that we'll see some results from this new alternative type of therapy. It sure would be awesome to see some real progress, no matter how small. Seizures are OK. Maybe a slight decrease in the amount of little ones she's having throughout the day but still way too many in the morning and too many of the nasty myo-tonics for my liking. Please keep her in your prayers, a little relief from these seizures would sure go a long way! Last night went better than expected. Reagan fell asleep after all of that crying and thank goodness she stayed asleep (for the most part). She did wake a couple times fussing, but I went in and shushed her and then finally brought her into our bed where she slept until 8. We really have been blessed that she's been sleeping better lately. She usually doesn't make it the whole night in her bed, but many kids don't, and it's certainly better than her waking up screaming every hour all night long. That was tough. Reagan has actually been a doll today. No sign whatsoever of those tummy pains from yesterday. She's been very vocal...I'm just waiting for some real words...she's so close. She says lots of stuff that sound like words, I just don't know if any of it is associated with anything. She still says gaga from Grandma, but just lately she's been saying nene. I actually thought maybe I was nene, but today she was saying it like crazy to Grandma so who knows. She's said Reagan twice. I know it must be a complete and total accident, but she said it as clear as day. She said NO the other day when I was messing with her toenail. Again, had to be a fluke, but it was too funny. We also hear dada, dog, and mama on occasion. Oh my goodness, if we would hear some real words, we would just melt! It's like when she makes eye contact with you now, she doesn't do it all the time (but she used to never do it)...it's so amazing. She's such a little angel! Boy do we love this girl. Reagan slept well last night and woke up happy this morning. She was in a good mood for most of the day. I forced her to spend some time on her tummy and although she whined about it a little bit she did OK. She actually ended up falling asleep while on her tummy (see picture below). So our day went fairly smoothly, no real bumps, that is until this afternoon. We never do anything. Rarely even go out to eat, but some neighbors had asked us to go have some BBQ tonight so that was our plan. Only minutes before we were supposed to leave Reagan started crying. Screaming crying. The tummy pains strike again. We attempted to go, we even left and started driving but after a little while we realized she wasn't going to stop so we turned around and headed home. It's frustrating. Not only does Reagan have to deal with these horrible seizures, she's also plagued by relentless tummy pains. And we as parents are left feeling completely and totally helpless. She cried for 3+ hrs with no relief and then finally fell asleep. Poor baby. Her face was so red and her eyes so puffy from crying, it broke my heart. I hope she's able to sleep tonight. I managed to get her medicne in her right before she fell asleep, so hopefully she's down for the night. Please keep her in your prayers. I think we're finally on the upswing of the stomach virus. So far Reagan hasn't had a single dirty diaper all day (and no more throw up), although as I type this she's fussing and I think it's because she needs to go. Uh oh, maybe I shouldn't have skipped her Miralax. Reagan's feeding therapist called today to cancel her appt because she has also come down with a stomach virus. Probably not coincidence considering Reagan had therapy on Monday and then was already showing symptoms on Tuesday. Overall she's been in a good mood today. Still pretty floppy and lacking head control, but I did start weaning the Clobazam so hopefully that will help. Now she's at 3/4 dose 3x day. Seizures are still yuck. She's having lots of twitches/spasms especially after waking and I counted and she had at least 7 of the myo-tonics today. I've never actually counted those before and she's having more than I had thought. She was very hesitant to take a nap today. Her first wasn't until 3:30 and it was a short one. She took another nap from 7-9pm and I had to wake her up from that one because she was out cold and hadn't taken her medicine yet. I'm not sure why she's fussing tonight...maybe she's just cranky that I woke her up out of her good sleep or maybe she has something brewing in that little tummy of hers...who knows. Hopefully she'll sleep it off and we'll all get some rest tonight. So I guess my girl is officially sick. She seemed well enough this morning, she had a good 8hrs of sleep last night and she woke up and had only one dirty diaper today. I fed her some of her bottle and was just holding her on my lap when I heard a weird noise. I leaned her over somehow anticipating what would come next. Throw up. She had a little incident while I was holding her in the living room, I jumped up and ran into the kitchen (all tile) and she proceeded to throw up all over the floor. She was covered, I was covered, it was a mess. Poor thing, it was even coming out of her nose! So then I was faced with the daunting task of getting all of her meds into her on a queasy stomach. She was having lots of seizures so I knew she really needed to keep this down. I mixed it in with the tiniest bite of baby food and somehow she managed to keep it all down. Let me tell you, I was a nervous wreck for an hour or so waiting for it all to digest. When they throw up their medicine it's a huge deal because you don't know how much of it they got and how much you need to give them again. I'm just glad I didn't have to deal with that. Of course, I did forget to give her her middle of the day dose of Clobazam. Oops. It just never occurred to me. After speaking with the pediatrician's office, we were only giving her pedialyte, so the last thing on my mind was trying to get more food in her. Oh well. She did seem to tolerate the pedialyte pretty well today, so I slowly introduced some formula tonight and she seemed to be OK (thankfully she only threw up that one time). Ugh. We do not have time for a stomach virus! Today she only had 3 dirty diapers but I think that was probably due to the fact that she didn't eat much real food. I did finally hear back from her neurologist tonight. He said that it's fine for us to start weaning the Clobazam...although I do want to keep her on some small dose of it because it is helping her to finally get some sleep at night. Next step Banzel. He's still slightly hesitant because he's never used it in kids Reagan's age, but he does think it's worth a try (considering we're about out of new options for her to try). Personally, I know of plenty of kids Reagan's age that have tried it. Of course, it hasn't worked for any of them, but Reagan is certainly unique in her response to meds so maybe it will work for her!?!? So that's the plan. We'll start Banzel (probably in the next week or so) as we wean her down on Clobazam. Next step Topomax...which probably isn't doing much for her but we haven't seen a true tonic or tonic-clonic since starting it. Problem is, you never really know what a medication is doing until you take it away. Please keep Reagan in your prayers...between stomach issues, seizures, and medication changes...she needs some extra prayers. It's strange but today has almost been a complete carbon copy of yesterday. Reagan's sleep last night was exactly the same, she slept well and woke up once but fell back asleep in our bed no problem. Then she woke up and had two dirty diapers immediately and then two more during the day (that's right, 4 again, must be a stomach virus of some sort), and in spite of it all she's been in a great mood all day today. Seizures were pretty rough this morning. Tons of twitches and spasms...for a while she was seriously having at least one a second! That warranted a call in to the neurologist, of course I just left a message and got a call back from the nurse but never heard from him. Thankfully they eased up a little as the day went on. She's still having way too many of those nasty myo-tonics. The worst part about those is the dazed look and groaning noises she makes as she's comes out of it. I don't like it at all. She's now officially off of Keppra. Maybe we'll see some improvement from that change over the next few days. I hope so. Please keep Reagan in your prayers, as we continue to adjust her medications (and probably add a new one) over the next couple weeks. Sleep was improved last night. Reagan woke up once but fell back asleep immediately when I laid her in bed with us. She's so precious...laying there fast asleep on my pillow. She woke up in a good mood today, which is amazing because she was having lots of seizures and had two dirty diapers immediately after waking. She actually had 4 dirty diapers total today. That's not normal for her. That's not normal for anyone! Did someone feed her some Mexican food without me knowing? Poor thing. Her tummy has been rumbling all day but it hasn't affected her mood. Somehow she's managed to be sweet all day. It's strange how she can have one dirty diaper that causes her hours and hours of pain, but then she can have multiple dirty diapers that don't seem to bother her much. Strange. I spoke with the GI doc yesterday and she told me that the allergist doesn't want to see Reagan. According to her, the inflammation/increased Eosinophils they saw in her GI tract doesn't usually yield conclusive results with an allergy test. Of course, the GI doc said the exact same thing about doing the scopes on her...that they probably wouldn't find anything...and they did. It's just frustrating. Reagan obviously has some serious GI problems and they are doing absolutely NOTHING to help her. And the GI doc we're seeing is supposed to be the best (at TX Children's anyway). I'm just so jaded when it comes to doctors now. I guess that happens when your child sees multiple specialists none of which can help her. I'm so frustrated. So now our only option is to give Reagan an oral steroid to try to calm down the inflammation to see if that helps with her pain. Problem is, the side effect of the medication she prescribed is diarrhea. Sorry, but we don't need any more of that right now. Ugh. We can't win. Something interesting that another parent brought up to me is that their child (who has been diagnosed with mitochondrial disorder) also has increased numbers of Eosinophils in their GI tract. Interesting. To be honest, the second Reagan's GI mentioned this, that is the first thing I thought about. Ever since our trip to Detroit, I've been thinking very seriously about having the muscle biopsy done to check for mitochondrial disorder. Dr. Chugani thinks it's worth doing and so does her local neurologist...they just want to make sure that we've done all of the easier, less invasive tests first. It's certainly not a test you want to come back positive, but I think it's something that warrants further investigation. I increased her Clobazam again today. I don't think it's going to help but I'm doing it to appease her doctor. The recent changes don't seem to be doing anything, it's not making her sleepy but it's also not helping her seizures whatsoever. Actually, now that I think about it, I wonder if the decreased head control could be related. Maybe. Today she about drove me crazy because she kept choking on her spit. It's like she forgets to swallow and then chokes and gags on it. I guess that could be related as well. I don't know. It's looking like a new medication is in our future and I just want something to work already! Please keep this in your prayers. Reagan was a little turkey last night. Woke up fussing and not wanting to go back to sleep around 3am. I tried a couple different things and finally was able to get her back to sleep. It was short lived though and she woke back up way too soon. Our busy day started earlier than I had hoped. We battled the first day of school traffic and made our way into the medical center for Reagan's physical therapy evaluation. The lady that did the eval was an older (= experienced) therapist and she gave us some good suggestions on things we should work on with Reagan (hopefully we'll end up with her actually working with Reagan but that isn't always the case). She recommended something called add-a-bands to put on her legs to help stabilize them and give her a little extra support when we are working on sitting at home. I've never seen them before, they are these straps that velcro around her thighs and keep them in the right position for sitting, and when she put them on Reagan, they did seem to help her. Reagan was a little floppy today. And she was severely lacking in head control, which made things difficult in therapy. Although, she was extremely tolerant of everything. She let them do whatever they wanted to do to her...sitting her up, laying her down, doing uncomfortable stretches, she was calm and relaxed the whole time (a little out of character for her). I also think it was a little deceiving for the PT, I don't think she has any idea of how extremely high tone Reagan can be in her legs/feet. I guess if we end up with her she'll figure that out pretty quickly. From there we went over to feeding therapy and Reagan passed out cold right before we walked in. She's been asleep before for feeding therapy (and her therapist can still do different stretches on her) but she was REALLY out of it. I don't know if the PT evaluation tired her out or what but she was completely and totally limp. She did wake up right at the end, so at least she was awake for her OT right afterward. Again, the lack of head control was interfering a little, but she did some get work done and was very tolerant of everything (it's funny...both therapists commented on that). Actually, she didn't make a peep all day, she really was a good girl today. Hopefully the busy day will translate to a good night's rest tonight. My busy little bee needs some solid sleep (and so does her Mommy). Another good night's sleep last night. Reagan did wake up early around 5:30am because of tummy pains. She was crying a lot and then I heard it...she filled her diaper. Poor thing. She seemed to get some relief from that and was able to go back to sleep. Then all day she was great. My mom came over and worked with her on her tummy (she's been reading the book from the Institutes and is inspired). Reagan did really well...considering being on her tummy is not necessarily her favorite place to be. While she was occupied I was able to get some things cleared away in our kitchen...it's finally starting to resemble a kitchen instead of a junk yard. Now all we need are some groceries. We have GOT to go the grocery store...we had plans to do that tonight but it just did not happen. Reagan actually started getting cranky as the sun went down and then she had another dirty diaper! Two in one day, that's a lot for her. And talk about stink! It was lethal. And liquidy (sorry)...it makes me wonder if something more isn't going on. We sure don't need a stomach virus with a kid that has excruciating pain every time she goes to the bathroom! Hopefully she'll be good to go tomorrow since we've got a full day planned. She's got an evaluation at Texas Children's for PT (since we moved she hasn't been getting any PT at all), then feeding therapy, and then OT. Busy day. She was picking her head up really well, I just didn't get a picture of it! Reagan had a much, much better day today. We all got a good night's sleep last night too...thank God! We didn't do much today, just tried to recoup after yesterday's drama. Reagan had a few questionable moments, where her tummy was giving her problems yet again, but she managed to pull out of it and end on a good note. She was so smiley and sweet tonight...she can be such a darling when she's happy and feeling well. I increased her Clobazam this morning, so far no changes in seizures. Still having too many of the myo-tonics; I hate those. It's the fact that they seem to really upset her that bothers me the most. I'm just praying that we'll see some relief from increasing the Clobazam, if not, the next step will be Banzel. Please keep her in your prayers. I promise to post some sweet pictures of the little princess tomorrow. Today started off well enough. Reagan slept straight through til 6:30 or so. She did wake up fussy but she went back to sleep and I woke her right before we had to leave for therapy and she seemed fine. She made it about 3/4 of the way through her Feldenkrais/ABM session and then our day fell apart. The tummy pains strike again! We moved her around trying to work it out and we were successful in our efforts. I thought that would ease the pain, but no. She cried the whole drive home, she cried at home, she cried in my lap, on the floor, in her bed, she cried non-stop for over 7hrs! Seriously...every waking second she was crying. The horrible gut wrenching crying, her eyes were all red and puffed up, she couldn't even catch her breath, it was relentless. Is it me or is this just ridiculous? Why should she suffer with such pain!?! There has GOT to be something that could help her! And then to top it all off, she had several of the bigger myo-tonic seizures. It was horrible. Finally she took a nap this afternoon and woke feeling loads better. Thank God. I did finally hear back from the neurologist today. He said that we can try going up a little more on the Clobazam (7.5mg for the am dose) and we can continue with weaning her off the Keppra. That sounds good to me. She's on way too many medications to still be having so many seizures. Please keep her in your prayers. She needs a break this weekend! This was only the first hour of crying, but it pretty much sums up our day. How sad is this? Last night wasn't a fun one. Reagan took a late nap yesterday and was still wide awake at midnight. Well, she wasn't going to just lay down either. She was awake and feisty. I tried her in her bed on her back, in our bed, then in her bed on her tummy...nothing was working. Then even after she finally went down, it didn't last long. She woke back up fussing and whining some more! We figured it was tummy pains, but I'm still not sure. She was definitely a challenge, that's for sure. She hasn't had much in the way of naps today so hopefully we'll have a better night tonight. Despite the rough night, Reagan woke up in a great mood this morning. And she was a little angel again for therapy. She really has mellowed out a lot in her "old" age. Other than days when she's having those horrible tummy pains, she really is a super sweet girl. I remember when she used to cry all day and all night. Now that was a challenge! It was a rough first year and a half or so. It's amazing that she can keep a good attitude despite having so many seizures. Poor thing. I left a message today for the neurologist, but never heard back from him. Not sure what our next step will be, but she definitely needs some relief from this. Please continue to keep her in your prayers. Not much excitement today...just the way I like it. Last night Reagan slept well. I love that. She woke crying at somepoint this morning and we just put her in bed with us and she fell right back to sleep. Then we got up early and went to an early session of Feldenkrais/ABM. I won't pretend to know much about these methods, but essentially they're all about body/self awareness. Reagan doesn't know she has a hand or a leg, that's why she doesn't use them. Makes sense. Reagan was in a much better mood for today's session. She was talking up a storm again. I swore I heard a few mamas in there! I was priming one of the bathrooms today and she was in the other room with her musical toy and out of nowhere she said something that sounded like a complete sentence. It was weird...it didn't even sound like her! Maybe someday we can get some real talking out of her?!?! She's definitely trying. If only we could get control of these stinking seizures. We haven't seen any improvement seizurewise with the adjustment of her Clobazam dose (other than the very first day, but that must have been just a fluke). I guess I'll put in a call to her neurologist to ask him what next? Although my guess is probably as good as his. Seriously. Please keep all of this in your prayers. Reagan SO needs a break from these seizures. We had a little scare today. Everything started off well enough. Last night Reagan only woke once, but this time she was not having it in our bed. I gave her some formula and then laid her in her bed on her tummy. She fussed a little but then she was out! She didn't even wake up at 8:45 when I loaded her up into the car for our trip in to Texas Children's. Today was her one week post-op check-up. I wasn't expecting anything out of the ordinary. Her eye looks good and she even seems to be seeing better than before the surgery. She's making a lot of eye contact (a lot for her anyway) and her eyes are less crossed and she's keeping them more open than before. By all accounts everything was going well. Then during our very routine doctor's appt the doctor mentions that she doesn't see Reagan's lens implant in her left eye (the one that was just operated on). She was afraid that it had detached. In order to see more clearly she had to dilate Reagan's eye and then she sent us out into the waiting room to ponder the horrific scenarios of yet another operation! It was an excruciating wait. I did a lot of praying. About 30min later they came back out for us and she took another look. She still didn't seem 100% positive, so she used that big contraption that's attached to the seat. The one that you put your chin on. They held Reagan up with her chin on it so the doctor could get a clear look into her eye...and there it was, her lens implant, exactly where it's supposed to be! Everything looks great. Thank you for scaring the you-know-what out of me! This doctor was not her cataract surgeon (she was out on vacation), it was her previous ophthalmologist...the one that diagnosed her with cortical visual impairment, spotted her first cataract and the last one that was just operated on. Despite all the bad knews she's given us, I do repsect her as a doctor, so I was a little concerned that she was concerned. Thank God that it was just a false alarm. Talk about a sign of relief. Whew! 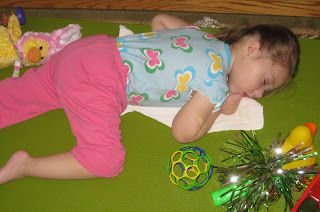 So after all of that, we headed over for Reagan's 2nd Feldenkrais/ABM session of the week. Reagan wasn't nearly as cooperative as yesterday. I think she was slightly irritated by everything that went down at the doctor's office. We even ended the session a little early because of Reagan was just not that into it. Again she went the whole day today with nothing more than one little nap. Below is a picture of her in deep sleep this morning. Too cute, I had to take a picture (notice the legs crossed at the ankle...and the giant bug bite on her leg...this girl is seriously allergic). Reagan slept well again last night. I guess she likes keeping us on our toes with this every other night thing. Last night she woke once crying, I picked her up and put her in our bed and she fell back asleep til 8am! Very nice. She also woke in a great mood again. I guess a good night's sleep makes her just as happy as it does us. She was very talkative and smiley all morning. We went in this morning for a session of Feldenkrais/Anat Baniel Method. 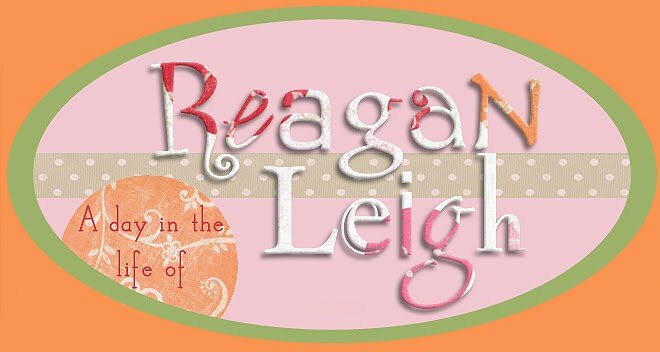 It's been a while since Reagan's last session (with the move and all she's doing very few therapies), then out of the blue I got an email a couple weeks ago from the practitioner telling me that she thought Reagan might get more out of the sessions if we did multiple sessions back to back. Since this is all out of pocket that scared me a little, but as I read on I realized she wanted to do the sessions free of charge! What? I was amazed. She just finished some advanced training in California with Anat Baniel herself and she said that the best way for her to progress in this new method is to practice what she's learned. Initially she mentioned doing a 5 day block of sessions with Reagan (one 45min session per day), but now it's sounding like she might be willing to work with Reagan on a more regular basis without cost to us. Talk about a blessing. I really like the idea of trying something new. 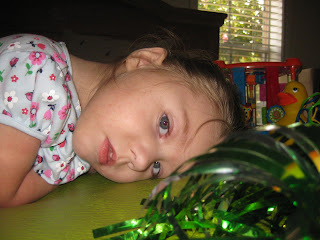 Reagan has been receiving standard therapies for almost two years now and she hasn't made any real progress whatsoever. That's really what peaked my interest this new type of therapy to begin with. It would sure be great if we could find something that works for her (even if she continues to have seizures). I hope to see some progress...any progress! It's crazy to think that Reagan still doesn't even roll (not to mention sit, crawl, stand, walk, and talk). So today was the first day of our 5-day block. Reagan was great for the session! Super cooperative and happy the entire time. I'm hoping she'll keep this up the rest of the week. This afternoon she wasn't as happy, but she was also never really took a decent nap today. Hopefully that won't affect tonight's sleep in a negative way. By the way...today is my sister's 24th birthday! Happy birthday Amber! I knew yesterday was too good to be true. Last night Reagan was up nearly all night! She was crying inconsolably from about 2-6am! It had to be her tummy! I kept expecting a dirty diaper, but it never happened. It was a miserable night for all of us. These tummy pains are just so frustrating! And things aren't looking promising with the allergist. I spoke with the GI doctor last week and she said she has been going back and forth with the allergist about whether or not it's worth it to do further allergy testing. She said that the number of Eosinophils they saw in the biopsies from the colonoscopy/endoscopy, while elevated, wasn't necessarily at the level she would expect with an allergic reaction. My concern is the widespread inflammation! Hello? What do they think that's coming from? I don't know. 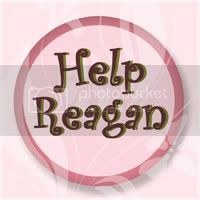 I'm just getting so sick of no one being able to help Reagan. It's beyond frustrating! 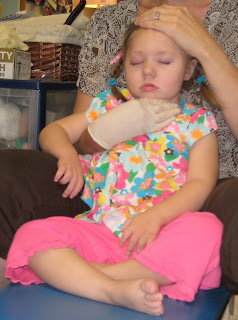 Speaking of frustrating, seizures are still throwing us for a loop. Yesterday, when Reagan was in such a great mood, she had very few seizures all day and only one of the big ones. Then today they were back up in number. It definitely seems to affect her overall mood and personality. She was very groggy and quiet today, nothing like the happy chatterbox she was yesterday. I'm sure the increase in seizures and lack of sleep were responsible. Oh, if we could only get control of these darn seizures. Please keep this in your prayers! On a positive note, Bear (our black lab) joined us in our new house today. He's going to love it here! Our backyard backs up to a former golf course and at night everyone walks their dogs out there. It's great because we've already met some really nice neighbors (we lived 6 years in our other house without ever really getting to know any of our neighbors). Bear even took a swim with his new friends, of course I had to give him a bath afterward, but at least he had some fun (and got some good exercise). Last night was awesome! Nothing like a good night's sleep to give you a little pick me up. Reagan slept from 10:30pm-8am!!!! I don't remember the last time she slept that long. It was great. Then to top it all off, she's been in the best mood ever today! Extremely talkative, so happy, just an absolute and total delight. I wanted to get it on video because it was just too cute, but I couldn't find the video camera among all the boxes. Speaking of boxes, there seems to be an infinite number of them to unpack. I spent all morning unpacking and I didn't even make the slightest dent in them. Mike was busy trying to get the cable working in the remodeled living room and cleaning out the garage, both of which took a lot of work. Somewhere in the middle of all of this our A/C went out! Yep, that's right...in this sweltering heat. What's crazy is my mom's A/C went out the day after we moved out (some luck this family has)! It was a humid 84 today in our house. Yuck. Thankfully we got one of those home warranties on our house when we bought it, but since it's a weekend we probably won't hear from them until Monday. That being said, this afternoon Mike decided to go and and see if he could get it running again and sure enough he did! They still need to come out and replace a part or two, but at least it's working for now. I was afraid I wouldn't make it a night without A/C. Not here. It's just too darn humid. So hopefully it will hold out until Monday. Meanwhile, our hot water heater does not seem to be working either. Sounds like we'll have to call someone out for that too. Talk about luck. Oh well. Reagan had a great day, that's all that matters! So last night wasn't exactly the great first night we were hoping for. Reagan did not want to go to sleep and we were up til midnight with her. Finally she dozed off in our bed and we didn't even attempt to move her (at least in our bed we have the option of co-sleeping). The problem is, co-sleeping with Reagan is often shortlived and she woke around 2. I got up with her, gave her a bottle and when she finally fell back to sleep I put her in her room. She slept in a little this morning but woke up in stinker of a mood (and a stinker of a diaper). It was hard to get much done today housewise, Reagan was very needy and having way too many seizures. The bigger ones that really worry me and leave her zoned out for a minute or two afterward. I don't know if this is a different type of seizure or what. I spoke to her neurologist today about all of this and didn't really get much of an answer. His suggestion is to spread out her clobazam into 3 doses. Right now she's getting it twice a day but he said that this medicine in particular tends to have a short half life so it may be wearing off overnight and throughout the day. So we would divide up her current dose to 5mg in the am, 5mg midday, and 10mg at night. I'm not sure if this will do anything, but he's the doctor so I'll humor him for now. I'm just so sick of watching her have seizures. Today has been one of those days where I'm feeling particularly down about it. I try to stay positive and hopeful but some days it's just so hard. How much longer can she continue to have continuous seizures like this? How much permanent damage is being done? It's frustrating. Please keep her in your prayers! Well, we got our wish! Reagan slept like a rock last night and so did we. She didn't wake until this morning when Mike was getting ready for work (it's his fault). Even with all the sleep, Reagan has been really floppy/groggy today. Not sure what that's about. But thankfully she has been in a good mood all day. We did PT this afternoon and she was very cooperative but she did wear out fairly quickly. She spent some time in a stander at therapy while wearing AFOs, it's been a while since she's used either one of those! Hopefully things will change now that she has her own therapy room, that is, once it's cleared out (which it's filled with extra furniture and boxes right now). Tonight will be our first night in the house. I'm not sure if our internet or tv is working yet, so I'm typing up the blog a little earlier than usual. There's still a lot to do but I guess it will be easier to get it done if we're living there. I'll probably move the dog and the rest of our stuff from my mom's house this weekend. Seizures continue to plague us. She's still having lots in the morning, but the smaller ones seem to taper off during the day. She's definitely having less in number througout the day but the ones she does have are very big and definitely seem to upset her. They upset me too. I hate it that she's still battling these nasty things. It's just not fair. Please keep her in your prayers...she SO needs a break! Last night was a little rough. 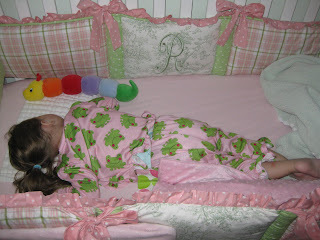 Reagan was just restless, she was extremely difficult to get to sleep and even harder to keep her that way. Every single time I'd get up with her to go lay her down, she'd wake back up. Finally I just laid her in bed with my mom and she shushed her to sleep. Unfortunately that didn't last long. She woke up crying around 3 and I got up with her. Lots of whining and fussing, she just couldn't seem to get comfortable. I had to lay down beside her to finally get her back to sleep (bumping Grandma out of her own bed). Hopefully she'll sleep a little better tonight, now that her patch is off, because we're all exhausted. We went in this morning and her doctor took the patch off and examined her eye. She said it looks good...no signs of infection. She said there are only two tiny incisions so she doesn't anticipate Reagan having too much discomfort. Of course, she didn't take gas pains into account. Reagan had a horrible bout of tummy pains this afternoon. She was fine all morning and then this afternoon I went over to the house to clean a little and that's when it hit. Lots of gas, lots of crying. Poor girl. I was actually beginning to think things were getting better because she's had 3 dirty diapers in the last 3 days, all of them without crying. Maybe she just missed me. She did seem to calm down about 30 min or so after I came home, but that could just be coincidence. Still no word on getting her into the allergist sooner. I guess I'm going to have to call them about that tomorrow. We're super close to moving in to the new house. They've almost completely finished with the renovations. The only thing left to do is repaint the trim in the living room which is going to be done tomorrow. It looks good. There's still some stuff we need to finish up ourselves, like changing every light fixture in the house and painting all the bathrooms and Reagan's therapy room, but we'll probably finish those things up over the next few weeks while living there. Reagan slept like a baby again last night. Not a peep...boy is that nice! She woke when we put her in the carseat at 5am to head into Texas Children's. We used her new stroller and it worked well. Very easy to manuver, perfect for the crowded spaces at the hospital. Reagan was in a great mood this morning. Very talkative. At one point she was so loud and making so much noise in the waiting room, I could hardly believe it was her. When I handed her off to the anesthesiology nurse she was bright eyed and so smiley! It was just too sweet! Her surgery went off without a hitch and the surgeon came out to talk to us in what seemed like record time. They took her back at 7:55am and her doctor came out at 8:35am. She said everything went well. BOTH eyes are nice and clear now...every other time they told us they found a new cataract...so this is great news! About 20min later they came and led us to the recovery room and there was my little princess sleeping in the middle of chaos. These recovery rooms are filled with irate kids (usually 6-10 years old) that are screaming at their parents and every nurse that comes into sight. It' s quite irritating. Reagan laid there for a while twitching a finger here and there but not opening her eyes. It wasn't until I picked her up that she finally woke briefly. Exactly long enough for me to get 3/4 oz juice and her medicine in her. Then she was back out. She slept the whole way home and then for a couple hours afterward. Although after finally waking, it's been hard to get her back to sleep. She didn't really want to take naps this afternoon and she doesn't want to go to bed tonight either. Lots of moaning and groaning. I don't necessarily think it's pain associated with the surgery, I think she's just irritated with that patch on her eye. That's got to be very disorienting, especially if you already have limited vision. She's given it a few good whacks and tried to "wipe" it off on my shoulder but no such luck. Thankfully, it comes off tomorrow morning at her post-op appt. Then it's the 4 week regimen of eye drops...oh, she loves that! I just hope we can get her to sleep tonight. With the stress of the surgery, having to get up so early, and all of the work we're putting into the new house...we're all exhausted! Please continue to keep her in your prayers for a quick recovery, no more cataracts and no more seizures!!! Today we went by Babies R Us and I decided to just get a regular Maclaren triumph stroller. I'm sure there's not much of a difference between it and the special needs version of it, the Maclaren Major (other than about $800 and a couple months of waiting on it), so I thought I'd just get it so we can use it now. We did find some really neat cushions that fit on the shoulder straps providing just the right amount of support for her head to keep it straight. I wish we would have seen these sooner! Who would have guessed that we'd find them at Babies R Us for $10 (of course they are made for babies, but whatever). Tomorrow is the big day (Tuesday for those of you reading this tomorrow). Reagan's cataract surgery is going to be the first surgery of the morning. We have to be there at 6am, although I don't think they start the surgery until sometime between 8-9am. Apparently Reagan isn't too worried about it because she slept great last night and she's already down for tonight. I'm always nervous about these things. Her little foot is still bruised from the IV she had in it two weeks ago for her colonoscopy/endoscopy. Poor thing. She's so sensitive. Please keep her in your prayers for a smooth surgery, no complications, and a quick recovery. Hopefully she'll sleep most of the afternoon, since she'll probably be a little irritated about having to wear an eye patch. We're waiting until after the surgery to give her her seizure medication. With the anesthesia, it's just not feasible for us to give it to her beforehand, so it's great that they were able to schedule her as the first surgery of the day. Sometimes that doesn't happen. They try to do the youngest kids first (babies and such), but realistically Reagan is at such a young age developmentally I think they should take that into consideration. Hopefully we won't get bumped. Please keep us in your prayers!! Today was another good day for Miss Reagan. She slept well last night and has been super sweet all day. We went over to the new house again and she couldn't have been better. I didn't get much done, other than changing all the knobs on our kitchen cabinets (48 of them). It's really coming together...I think it looks loads better than when we first bought it. Our paint job from yesterday looks great and the kitchen looks like a kitchen now that all the appliances are in place. Unfortunately the contractors still haven't finished up on the living room. All the dry wall is up and taped and floated, but no texture or paint yet. A few more days I guess. Other than house stuff, not too much going on here. I am getting a little nervous about Reagan's cataract surgery scheduled for Tuesday. Mike is going to be busy at work and can't go, which makes me even more nervous because he always has been able to take off for surgery, but my mom will come along with us so that's good. We've been testing out a couple special needs strollers and let me tell you, I am not impressed. The ones we have right now are Special Tomato brand. The buggy stroller is almost too small for Reagan right now. The shoulder straps are at their longest and there's not really any extra support when you compare it to regular umbrella strollers (the only difference is the $255 price tag). 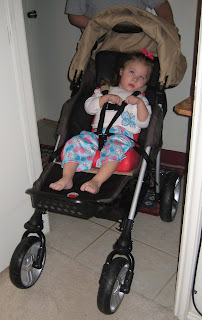 The other one is the EIO push chair. It has a little more support with lateral inserts you can use on the side and around the head. 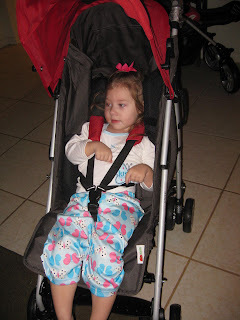 You can also use the seat liners for added support (they are too big to use in the buggy stroller). This is more of an all-terrain stroller ($455), which would be nice for getting around the neighborhood for walks, but I think it's just too big to cart around to doctors appts and grocery stores. I'm frustrated. I really wanted something light-weight but still supportive, so I could get out and do things more easily with Reagan. I'm not sure what to do at this point. The only other special needs stroller that is even an option is the Maclaren Major, but I really think it's almost identical to the regular Maclaren strollers, just hundreds more expensive. It makes me so mad that these companies call these items special needs and then jack up the prices to ridiculous heights. It's insane! I guess they just assume insurance will be footing the bill so they can charge anything?!?! It makes me sick. I think I might run by Babies R Us tomorrow and try Reagan in a few of the regular umbrella strollers. As long as it has a harness and reclines, I think it will work for her. We'll see. Reagan had a rough night last night. She was just very whiny and fussy, I don't know if her tummy was hurting or what, but she was difficult to get to sleep and she woke up a few times. Today, however has been a different story. She has been in a GREAT mood today. We went over to the new house to paint the master bedroom (now that the popcorn ceilings have been redone) and Reagan was an angel the entire time. We were there at least 8hrs and I don't remember hearing a peep out of her the entire time. My sister came over and watched her while my mom and I took painting duty. I have to say, it already looks SO much better now that it's painted. Our bedroom was a bright yellowy/orange color, so the "toasted almond" I picked out is a nice change of pace. Now all that's left are the bathrooms (the smallest of which we already tackled tonight) and Reagan's therapy room. That is going to be the biggest challenge. Something interesting to note, Reagan's seizures were few and far between today while we were at the house. I hope that's a sign of good things to come. Please keep her in your prayers. 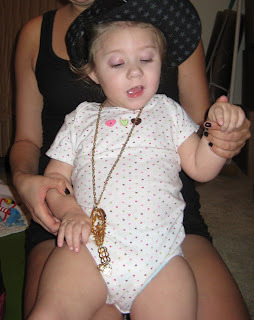 Below is a picture of her wearing a goofy hat and chain that my sister actually had on when she came over! We are polar opposites, but she sure cracks me up and Reagan was pretty amused too! Reagan slept fairly well last night. She was in with Grandma until 5am and then I gave her a little bottle and moved her into our bed where she cuddled with Daddy and fell back asleep. Today she had feeding therapy again. She did some really great chewing on gummy bears. Her therapist wraps it in a small piece of fabric and then puts it back on her molars and she munches away. Speaking of, I think she's got a new tooth back there...actually two. It's her 2nd molars, both of them on the left side. That would make #17 & #18! That's a lot of teeth! Not sure exactly when they started coming through, but they are both about halfway out now. That would explain the massive amounts of spit she's been producing lately. I guess that would also explain some of her irritability lately, although I think you can chalk most of that up to the seizures. They continue to give her a hard time. They wake her up while she's sleeping and then hit her full force once she's awake. I'm increasing the Keppra a little to see if it helps. At this point I'd try anything. Please keep her in your prayers. I'm just so frustrated with these seizures. We're almost two years into Infantile Spasms and we're yet to even catch a glimpse of the light at the end of the tunnel. It's so upsetting. She's fussing right now, so I better go and try to soothe her. Hopefully this won't hurt our chances for sleep tonight. Reagan has been on the verge of fussy all day. Just moany and groany, but thankfully no meltdowns (although she is due for a poop). She was supposed to have vision therapy this morning but she fell asleep only moments before. Her therapist tried her best to wake her up and get a session out of her, but it was not happening. This was probably her last session with this therapist, since we'll be moving into our new house which is in another county/school district. She started off with her almost two years ago when Reagan was diagnosed with Cortical Visual Impairment (CVI) and we'll definitely miss her. She's a very positive person, always very energetic about her job, and I think kids respond well to that. I'm just hoping we can find good, experienced therapists to work with Reagan in our new location. Speaking of new location, still a lot of work to be done there. The guys from our Bible study pitched in tonight and helped Mike empty our last POD into the house. Problem is, everything is still in boxes and totally out of place. We can't put anything where it goes because it's still a construction zone in there. The living room is in the process of being drywalled, the kitchen is covered in a thin layer of plastic ready for texture and painting, and our master bedroom ceiling is being textured and painted. It's a total mess. Meanwhile, I still need to paint all of the bathrooms as well as Reagan's therapy room. Lots to do. Mike and a friend from work attempted to install our new dishwasher tonight. No clue if they were successful or not. He's still missing in action. Maybe a job best left for the professionals? Hey, if it was up to me, I'd pay the professionals to do it all. I love watching home improvement shows, but when it comes to the actual labor of doing it yourself, I'm not a fan. The results are in...now what? Today has been a busy day. As far as I can remember, Reagan slept well last night. Sometimes my days and nights just run together and I can't remember which was which, today is one of those days. We've had a busy day today (with no naps to speak of). We started off with a visit to the ophthalmologist who confirmed that yes, Reagan still needs cataract surgery on her left eye (her 4th and hopefully last cataract surgery), so that is planned for next Tuesday August 11th. Then we headed over to feeding therapy where she had one of her best sessions yet! She was munching away on veggie straws! Big bites and real chewing! Very exciting. She took a few sips of apple juice from a cup! Baby steps. Then we were able to squeeze in a session with Reagan's favorite OT. With all the insurance issues we've been having we had to stop sessions with her for a while (which was so depressing because she worked so well with Reagan), but we've worked out an agreement with the center for a discounted rate and she'll now be able to see Reagan twice a month. That's great news! She did mention she that Reagan's tone felt a little better than before. I think it's the Clobazam. It's not helping too much with her seizures, but it is allowing her to finally sleep and loosening her up a little. While Reagan was in OT her GI doc finally called with the results of her colonoscopy/endoscopy. I have to admit, I was expecting everything to come back normal (since all of her tests come back that way) and because after initial inspection everything appeared normal. But they did find something. The biopsies showed a diffuse inflammation throughout her intestinal tract and the presence of Eosinophils , a white blood cell that could indicate an allergic reaction or infection, in every biopsy taken. Obviously inflammation and allergy could be causing the abdominal pain Reagan has been suffering with all this time. Reagan's doctor wants her to see an allergist to check for potential allergens before doing something more drastic like changing her diet or giving her a course of steroids. So that's the plan. Unfortunately, the doctor she recommended has no openings until Feb 2010!!! Insane! Hopefully her GI doc can call and get us in sooner. We'll see. I'm not waiting 6 months! So that's it. A busy day. New information, although I'm still not sure what to do with it. Last night was a rough one. 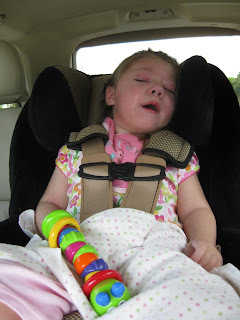 Reagan was waking up having tons of seizures. I don't know if they are what woke her up or what, but they were definitely preventing her from going back to sleep. Poor thing. I was holding her and she had finally fallen alseep, I was about to get up with her and all of a sudden, legs stiffen, arms jet out, head and neck fly back. It was definitely a tonic. Certainly not the long ones she was having before, but still scary nonetheless. And waking her up from sleep. Ugh. I hate seizures. I can't help but wonder if it's from us decreasing the Keppra. Even though she was still having lots of seizures while on the higher doses of Keppra, she wasn't having these big ones. It almost makes me want to tinker with her doses and increase the Keppra again to see if it helps. Problem is, even if they improve, she's still having hundreds of seizures a day. Nothing is really getting solved. I just don't know what to do anymore. I feel like we just keep running into wall after wall. Please keep her in your prayers. Still no word on the results from the endoscopy/colonoscopy...I'll have to call her doctor tomorrow. I guess she forgot about us. Reagan had a severe bout of the tummy pains tonight. I had to run over to the house and I left her at home with Grandma (sorry). She was not a happy camper. I just hope she's able to get some rest tonight. She's had a rough day. Again, prayers are appreciated. Last night was so much better than the night before. Thank you to all that said an extra prayer for us...it worked. Reagan slept straight through. Mike woke around 4am and then tossed and turned til 7, I think he was waiting for Reagan to wake up but she never did! It was awesome. We sure needed that. Then we gathered up our stuff and headed over to the new house to wait on delivery and installation people. We didn't have a long wait, the alarm guy arrived only minutes after we got there. The cable/internet guy came shortly thereafter. Then the contractor and finally the appliances. Unfortunately, we encountered problems at nearly every turn. First it was the alarm guy charging us ridiculous prices to install window sensors on the windows (it was like dealing with a used car salesman). I guess that's just one of the problems with buying an old house...newer houses are prewired for security. Then the cable guy...don't even get me started. He couldn't locate the cables in the attic, so he basically just did nothing. He also left before configuring the internet so that still isn't working either (I'm thinking about switching companies). Then the appliances show up and I HATED the refrigerator! We ordered monochromatic stainless, what I didn't realize is that doesn't mean stainless all over, it means a stainless front and a grayish silver paint on the sides! It was so ugly. I could have lived with black on the sides (since we have black granite) but the gray was hideous. Then they put it in place and it was sticking out a good foot past the countertop. So that was it, I told them to load it back up. Now I have to call first thing tomorrow and reorder a fridge that actually fits and hopefully it shows up ASAP. Meanwhile, after they installed the washer they realized there is a leak coming from the pipe (our responsibility), so that has to be fixed as well. The contractors were the only ones that didn't cause any problems. They showed up and began scraping the popcorn from the ceiling in the master and then ripping the paneling off in the living room. It was a three ring circus and I was a ball of stress all day. Thankfully Reagan was a complete angel and my mom handled her while I handled the mess. She's been having a lot of seizures today. Big ones too. I emailed Dr. Chugani about it and he said continue increasing the Clobazam. So tonight she's up to 1 pill for the pm dose. He said if this doesn't work he might suggest trying Depakote again (since she only tried it for a short 2 week period before starting ACTH). I don't know. We did the same thing with Keppra and that didn't work. It's just hard. We're running out of options and I just want these dang seizures GONE! Please keep her in your prayers! Last night was a horrible one to say the least. Mike and I were SO tired from working on the house all day and we were oh so looking forward to a good night's sleep, but sadly that did not happen. No way. Reagan's tummy pains started up and would not relent. She started to get fussy and by 11:30pm she still wasn't looking the least bit sleepy, then around midnight the whining turned into screaming. We're talking nonstop screaming at the top of her lungs! This went on most of the night. I knew it was tummy pains (she hasn't gone since her colonoscopy), so I gave her a suppository. It did clean her out, but those things always seem to make matters worse than better. Is it possible for a glycerin suppository to cause additional pain? I don't know. You wouldn't think so. Around 2am I handed her off to Grandma so I could get a couple hours of rest, but the crying continued. She finally fell asleep around 3am but that was short lived as well. At 4am I woke to more crying so I got back up with her. Finally at 5am or so she fell back asleep cuddled up next to Daddy. That lasted til 7 and then it was time to get up (again). Ugh. What a night. Thankfully she did wake in a much better mood this morning. Grandma watched her again today while we continued with the painting (and replacement of ugly fixtures) at our new house. My dad and stepmother came down to help us, we got a total of 3 rooms painted and one primed. We are totally wiped out to say the least. I forgot about increasing the Clobazam tonight so we'll probably start that tomorrow. Seizures are still rough. Very frustrating. Lots of prayers needed in that area. Very busy day today. Lots of running around and lots of buying this and that for our new house. It certainly gets expensive! We started painting today and it was very discouraging. It took us way too long to paint only one small room!! We've got to figure that out! Reagan spent all afternoon with Grandma at her house away from the paint fumes (which I'm sure she appreciated). I actually got the low odor, no VOC paint, so technically there shouldn't be any fumes but it did have a faint smell of something (just not paint). We'll have to take some pics of the new house and post them for everyone to see. Tomorrow is another day of work. Please continue to keep Reagan in your prayers...still having way too many seizures. Tomorrow is another Clobazam increase, prayers that it will help this time!